Whistle-blower Edward Snowden has some strong opinions on communications — even when those communications are coming from aliens. The former intelligence-agency contractor turned fugitive was an unexpected guest on famous astrophysicist Neil deGrasse Tyson’s StarTalk podcast on September 18. And, inevitably, the two got to talking about extraterrestrials. Snowden became an infamous household name in 2013 when he leaked classified documents divulging the government’s top-secret mass-surveillance program, which involved collecting personal information on Americans via phone records without their knowledge. When the news broke, the US charged him with theft and espionage, and he’s now living in Russia where he has asylum. But Tyson scored an interview with him in New York City. How? Snowden rigged a robot that he can control from Russia, and rolled right into Tyson’s office at the Hayden Planetarium in New York with his face displayed on the screen. 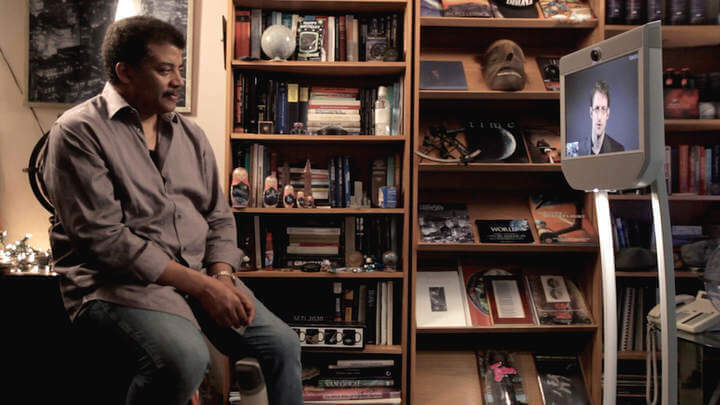 The conversation turned to encryption and cybersecurity, but here’s where an astrophysicist differs from a journalist: Tyson’s line of questioning quickly turned to how encryption relates to communication with … aliens. Tyson asked Snowden if a highly intelligent alien civilization might be communicating with encrypted messages. And Snowden had an unsettling answer. First, Snowden said, let’s assume that most advanced societies eventually realize that they need to encrypt their communication in order to protect it. This could also be the reason why we’ve never heard from other civilizations — their messages may have just been melding into the background static of the universe. So if you have an alien civilization trying to listen for other civilizations, or our civilization trying to listen for aliens, there’s only one small period in the development of their society when all of their communication will be sent via the most primitive and most unprotected means. So when we think about everything that we’re hearing through our satellites or everything that they’re hearing from our civilization (if there are indeed aliens out there), all of their communications are encrypted by default. So what we are hearing, that’s actually an alien television show or, you know, a phone call … is indistinguishable to us from cosmic microwave background radiation. Of course, that’s assuming an alien civilization has the same security issues that we have here on Earth, and they need to worry about protecting their communication system from their alien governments, Tyson jokes. Snowden agreed that aliens might be a little more politically sophisticated than us.